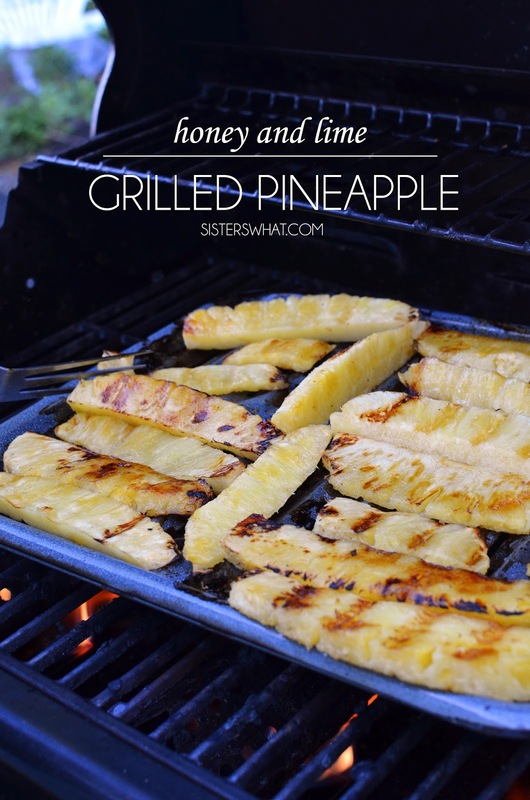 ' Honey and Lime Grilled Pineapple - Pinterest Challenge - Sisters, What! but my dad does and we went up for a weekend this month and I decided it would be the perfect opportunity to finally test out grilled pineapple. I pinned it ages ago, but obviously with no grill it hasn't happened. 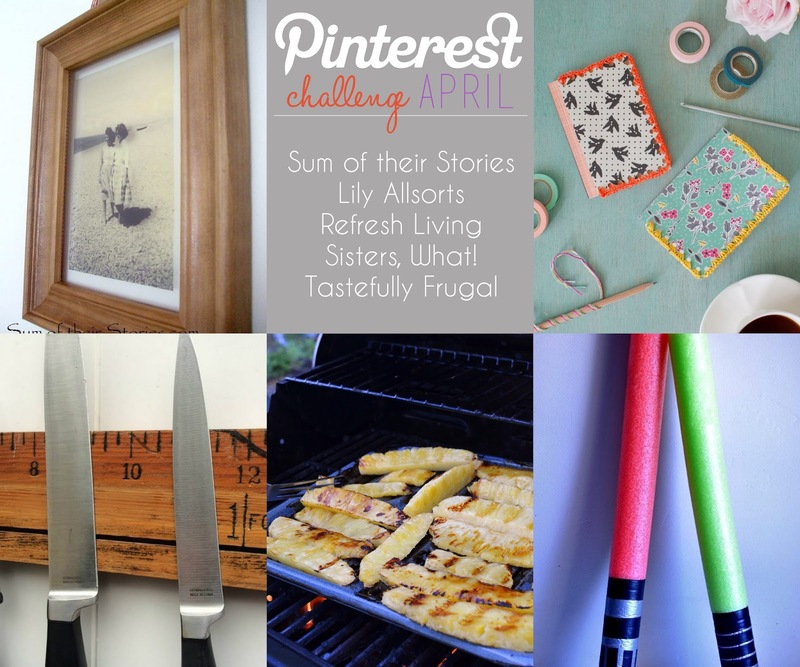 So I thought it'd be the perfect pinterest challenge to check off the list. I found multiple recipes, however I decided to combine a few and make up my own. I mean, who can go wrong with honey and lime? And I kind of have to come clean here. The best part was my husband cut and Sierra grilled it...everything taste better when you have help making it : ). Just wait till you see the shish kabobs we made too (stay tuned). mix all your ingredients together and pour over all of cut pineapple pieces. 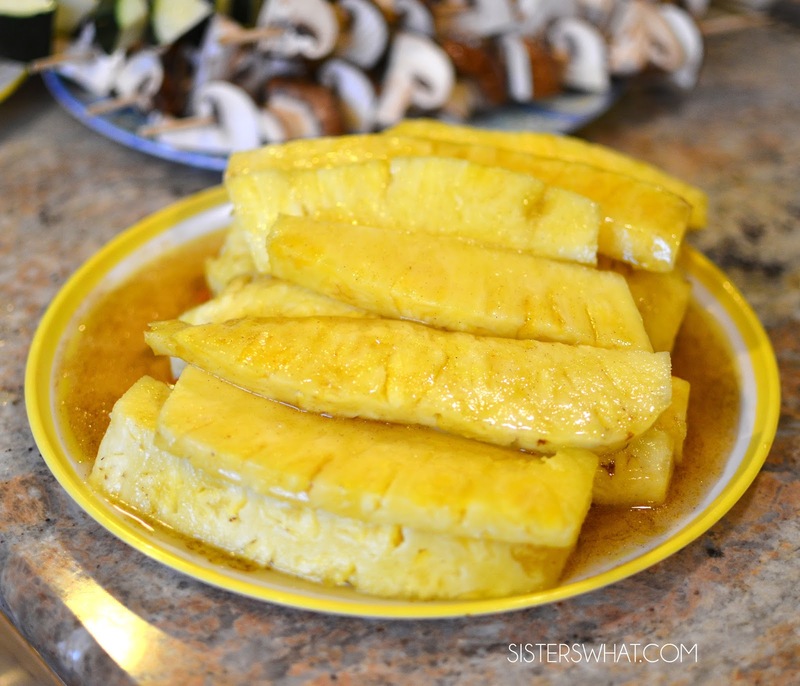 Place pineapple on broiler pan (you know, the one that you have among your pans that you never use : ) and place on grill. Cook until both sides are grilled. Then eat your heart out. 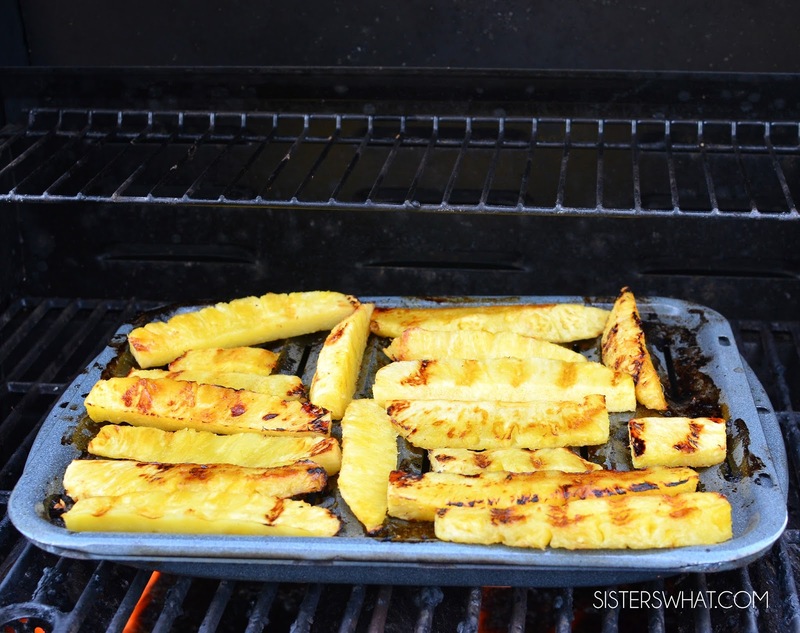 Seriously, this grilled pineapple is perfect for an appetizer, side dish, dessert or just by itself. My mouth is watering, looks great and so simple too! I've seen these on Pinterest but never tried them. Next time I see pineapple on sale I'm totally trying your recipe! Oh boy, I LOVE grilled pineapple and used to make them in my teriyaki turkey burgers (I won't spam you with a link, but it's on my blog! ;)... sadly, I recently found out that pineapples are one of the many foods that I have a high sensitivity to, and can't eat them much anymore :( These look tasty! 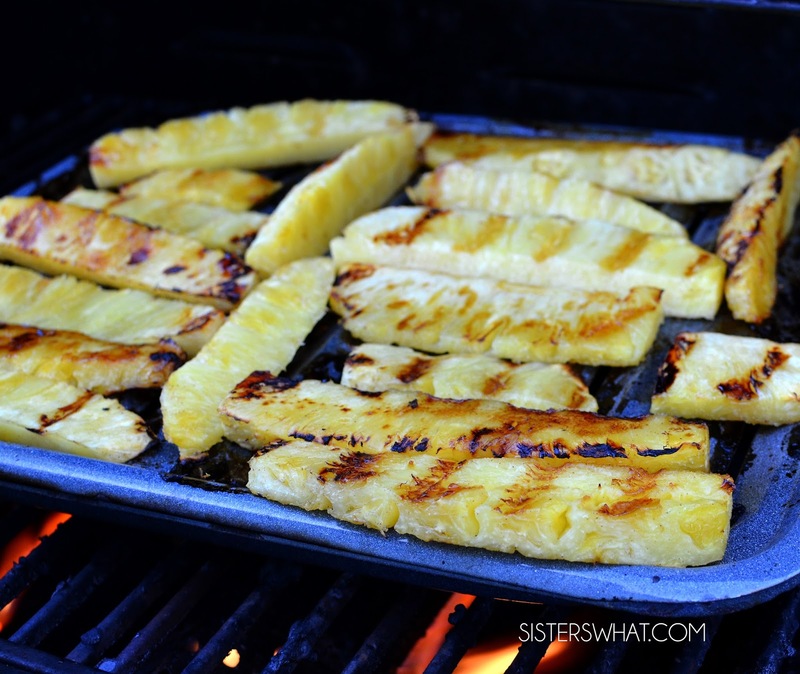 I love grilled pineapple! I can't wait to grill some when the weather returns to being nice! I'll have to check out those burgers, sounds delicious. So sad, my dad is sensitive to pineapple too. yes definitely try it, totally worth it. What a great idea! I've never tried pineapple, but we grill all kinds of vegetables. They are delicious! Do other fruits work well on the grill too? Oh, I bet that is sooooo good! Looks delicious!! I must try this over the summer! This sounds so yummy! Hmmmm... my sweet tooth is calling! Great pin to complete Havalah!